M-Tech � the preferred smart card manufacturers from India offers complete solution of Time Attendance/Access control system with hardware, software & post delivery implementation support. MTCB is a user friendly modular design system. This finger print and contact less reader works on standalone as well as on network mode. MTCB is featured with a high resolution 500 dpi optical scanner that enables users to provide best image quality of the fingerprints. The 13.56 MHz card sensor used finger print and contact less reader makes it as an ideal tool for different modes of verifications as per the industry needs. 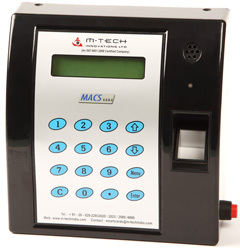 The finger print and contact less reader connects with Standard Time Attendance software which comes with Leave/Shift management records with standard attendance reports. We being the innovative and one of the pioneering smart card manufacturers from India provide specially designed finger print and contact less readers as per exclusive industry requirement. Thus our products offer maximum scalability to manage multipurpose solutions. Multi Interface as - Only Card, Card + Pin, Card + Bio, Only Bio, Bio + Pin etc. No need to maintain Attendance Register, paperless work. Time office staff can do their work effectively as no manual mistakes. Readymade reports for Payroll Integration through finger print and contact less readers. Cost effective solution to small/medium/large enterprises.